“What is the ROI of social media marketing? These are common questions asked by businesses and business owners all around the world. To answer those questions, we’ve compiled the Top 6 Reasons to Use Social Media For Marketing, so you can realize the true potential of social media marketing and don’t miss out on the huge opportunity it has. Social media marketing is not only about driving direct sales, as so many marketers seem to believe. Too many marketers are expecting to make a sale right after the first social media post, but it isn’t quite that simple. Among many other others, social media helps build trust, which is the foundation of making a sale, because if a customer doesn’t trust you, they won’t buy from you either. Those marketers who are skeptical about social media are often more old-fashioned and are focusing on display ads with low ROI. But who trusts a billboard? Social media lets you display your brand as more personal, and people need to see your brand as living and active, as this helps increase the chances of making a sale. As people’s trust in you increase, your credibility will do likewise. The more traction you have on social media, the more popular your brand will look and therefore boost your credibility. If you’re using social media marketing more actively and effectively than any of your competitors, you’ll soon become a thought leader in your industry, which is the end goal of credibility. Social media is the perfect tool for customer engagement. In a matter of seconds can customers send you a message, and in the same amount of time can you respond to them in a kind and personal way. By having constant dialogues with your audience, asking them questions and listening to what they have to say, you’ll quickly become more trustworthy and trusted, which means the chances of them buying from you is increased as well. In addition, if you succeed in building very personal relationships with your audience, they might want to support you just for the cause of you being so kind, and almost like a real-life friend, and buy something from you to show their support. This is one of the big points in social media marketing. In fact, a staggering 75% of people have purchased something because they saw it on social media. 57% of people are more likely to buy from a brand that they follow on social media. By being active on social media and reach & engage your target audience, you can dramatically increase your sales, as long as you are persistent, because studies show that most people have to see a product or service 2-4 times on social media before they purchase it. And nearly 20% of people need to see a social post or advertisement 5-8 times. If your competitors aren’t on social media, you’ll have a huge advantage if you choose to use it, because you’ll be able to reach audiences you wouldn’t be able to reach otherwise. If your competitors are on social media, that just means you need to work even harder to dominate your industry on social media. By having a strong social media presence, your brand will look big and powerful, making your brand seem more expanded than it might actually be. And it doesn’t exactly leave us wondering why this is happening. Followers are understood as popularity. If you have a lot of followers, it must mean that your brand is popular and a lot of people want to follow you. At least that how it is seen from the outside. Build a strong and large following and you can be sure to benefit from it. The bigger your brand is on social media, the more powerful your brand will be seen as. With social media, you can build your own brand voice and personality, and display it just how you want it to be seen. Visual content, captions and your chats with your audience are the biggest things that help decide what brand voice and personality you want your brand to have. Begin with creating a coherent brand message by sharing strong visuals and posts that give a feeling of connection. 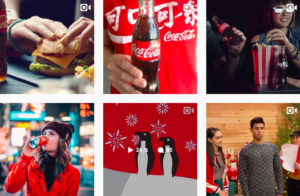 A brand that has succeeded very well in creating a connected brand message with their visuals is Coca-cola. When looking at their Instagram feed, it’s clear what color they want you to associate their brand with. But that’s a subject for another article. Learn how to create appealing visual content and create a strong brand message here. By developing a good brand image, you can give a better experience for your potential customers, and your unique brand voice might be that little extra push that was demanded, to make a sale. We could have just filled this article with statistics of the results social media is able to generate, but because that would only show a few of the benefits because it’s hard to measure things like brand awareness, we’ve dedicated one point to it. 71% of consumers who have had a good social media service experience with a brand is likely to recommend it to others. 64% of sales professionals reported closing at least one deal in 2014 as a direct result of using social media.